George Sorocold was working in the late 17th century and early 18th, mainly as a water engineer and in the harnessing of the power of water. He changed the lives of people in urban Britain and contributed to the first steps in the industrialisation of the country. He is best known for schemes such as Derby Waterworks and the installations of waterwheels and pumps under Old London Bridge, but his name is associated with significant early works all over the country, including the first wet dock at Liverpool and numerous town water supply systems. In their paper for the Institution of Civil Engineers, written during preparations for the first volume (1500-1830) of the Biographical Dictionery of Civil Engineers, Mike Chrimes and Susan Hots state that "... it is easy to make a case for considering George Sorocold (fl.1655-1717) as a candidate for Britain's first civil engineer, so great was his practice in water supply, harbour and river improvement schemes". Sorocold was one of the few figures of his era working as an engineer full time. 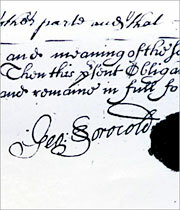 However, even the paper's confident statement draws attention to the mysteries about Sorocold, for the authors refer to his dates as fl.1655-1717, indicating that he flourished between these dates but birth and death dates are uncertain. Since that essay, further research has uncovered more information and undoubtedly more will follow. His contemporaries thought very highly of him and it's likely that more works remain unattributed. The authors have been investigating the life and career of Sorocold for a number of years and would welcome input from other investigators. If you think you can throw some light on questions such as where Sorocold received his engineering training, whether he was involved in the construction of Lombe's Mill in Derby, how he died or whether a portrait exists, do get in touch. Contact engineering timelines at engineering-timelines@severalworld.co.uk or join in the discussion on our social network page. 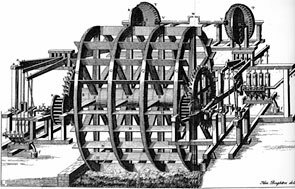 Drawing (published 1731) by Henry Beighton of Sorocold's beam-operated pumping engine and waterwheel design used for the new installations under Old London Bridge on the River Thames.